The emergence of cloud technology is providing a whole new way of thinking about what a law firm can look like. Mobility, lower IT costs, simpler IT and widespread acceptance that working from home is fine, drives the minds of legal entrepreneurs wanting to start their own firm and be their own boss. Because of the amazing advances in technology, it has never been easier and cheaper to start a law firm business. Ready? Let's get you started! 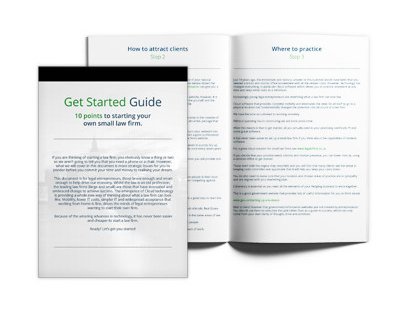 Download your comprehensive guide to setting up a law firm and managing it. Our legal practice management software includes everything you need to start a law firm business, manage the day to day requirements and start making money, fast. Make your practice mobile. Using cloud technology, you can work from anywhere at any time. Manage all your matters from the palm of your hand with LEAP Mobile. Attract new clients with your own customised and Google-optimised website, newsletter & blog. Organise your emails, letters and precedents with an Electronic File for each matter. Set-up a single database for all your clients and other parties. Capture all your time with an intuitive timesheet. Generate bills quickly and easily. Access up-to-date and automated legal forms. Easily understand your firm's performance.